Twenty-four-year-old photographer's apprentice Regina has always felt like the plain, dull orange next to the shiny red apple that is her best friend Lana. But then she meets Ben—the first guy to ever break Lana's heart, and the first guy to ever make Regina feel that he only has eyes for her. As Regina finds herself falling hard for Ben, she also finds herself breaking all the rules of best-friendship. Will she give up the love of her life for Lana, or will she finally realize that she deserves her share of the spotlight, too? 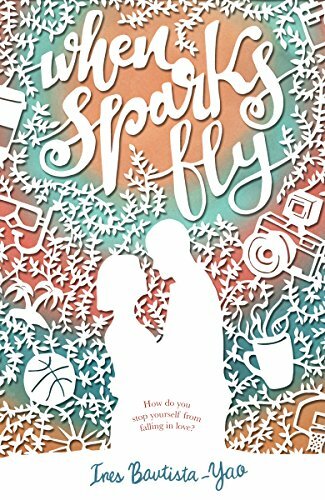 When Sparks Fly can be read as a standalone novel, but it is also a prequel to Ines Bautista-Yao's other book Only A Kiss. Romance isn't typically my thing. I try it from time to time, but it tends to be a little too formulaic and center around characters who aren't necessarily people I find interesting ... however, I'll read this series in a heart beat (I think this is the third from this "universe" that I've read ... I think it's more a universe than a "series" because while characters from other book show up as side characters, the stories are self-contained) because of a few points. 1. the writing is clean. It has a strong voice that carries you along. 2. the characters are well thought out and interesting, with a good mix of positive and negative traits and things they care about besides mooning over each other ... there's also a limit to the stupid drama. People fight about reasonable things, rather than contrived things ... and even the sort of over the top side character Lana manages to be likable while she's kind of doing the things that sometimes turn me off from romance heroines (helps that she's a secondary character and the more level headed lead is the one we're supposed to root for). 3. I like that these are set in the Philippines. It makes me feel like I'm taking a vacation. There's a hearty sprinkle of culture that manages to ground me the location, and I really like that. Honestly, the only small quibble was I could've done without the side story about the friend from college. It had some small plot influence, and it wasn't annoying to read by any means, but it didn't strike me as essential to the story or characterization. But it wasn't a huge distraction and it did make the book take about twenty minutes longer to read (I will admit to being an impatient reader and I don't think I'm necessarily the norm in this). I received an ARC in return for my honest review. Click through to purchase on Amazon.